Size of Male: 140-180 lbs., 24-24 in. Size of Female: 140-180 lbs., 24-26 in. The Tibetan Mastiff is a very old breed from Tibet, though it has only begun to be well-known in the West in the last few years. Tibetan Mastiffs are very large, powerful dogs. They can be strong-willed and stubborn. Dogs bred in Asia are often still bred to be ferocious flock guardians, although most breeders in the West breed for a softer temperament. These dogs are not appropriate for all families or living situations. Good socialization and early training are critical for this dog breed. 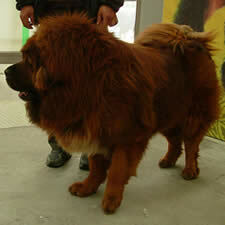 The Tibetan Mastiff is probably descended from a large mastiff type dog found in China around 1100 BC. This would make them part of the basic stock from which most large working breeds today are descended, including the mastiff and mountain breeds. Early dogs of this breed were probably isolated in the Himalayas and developed into the breed known today. In Tibet they were kept by Buddhist monks, among others. Nomads used them to guard their herds and flocks. These dogs also guarded homes and were kept tied out during the day and turned loose at night so they could protect against predators and intruders. These dogs only began to trickle into the West in the early 19th century. Although the Tibetan Mastiff has been a guardian for centuries, they are not killers. They have an almost “human” understanding. They have a long history of protecting women and children, as well as flocks and herds. They are said to have controlled strength, initiative, fearlessness, as well as patience, loyalty and gentleness. However, they can also be an independent dog, able to make his own decisions. They can be very stubborn and they do not usually do very well with obedience, although they need to be trained from a young age if you are to have any control over them. These dogs don’t necessarily like crowds and they are not known for doing well in dog sports such as obedience, agility or other competitions. They are what they are. They are noble and aloof to strangers and they don’t like intruders. They may not like having people visit your home. They are, however, very intelligent dogs, even if they don’t do well at dog training. They are simply protective and independent. They do love children and they generally get along well with other pets, especially if they are raised with them. The breed parent club cautions that these dogs can do a lot of damage to your house by chewing wooden furniture and woodwork, especially if they are bored. Living Environment – The Tibetan Mastiff does best if he has a large yard for exercise. It’s best for this dog to be contained during exercise. They can live in an apartment since they are not very active indoors but you will need to provide them with lots of exercise, preferably in a place where they won’t get loose. Grooming – These longer haired dogs need regular brushing. They don’t shed but they do “blow” coat once a year, when all the dead coat is shed at once. Diet & Exercise – Dietary needs for this large dog breed are normal. These dogs do require a great deal of daily exercise. It’s best if they are exercised in an area which is contained. A large fenced yard is ideal. Health – The Tibetan Mastiff is a relatively healthy breed but it can be prone to certain health problems such as canine hypothyroidism, entropion, ectropion, dog allergies, autoimmune problems such as demodex, missing teeth, malocclusion, epilepsy, cardiac problems, progressive retinal atrophy, cataracts, canine hip dysplasia and elbow dysplasia, and canine inherited demyelinative neuropathy. Of course, some of these issues may be quite rare in the breed. If you are interested in this dog breed, you should talk to a breeder about possible dog health problems. The Tibetan Mastiff is not an easy dog to train. These dogs are very intelligent but they are independent thinkers, as are many livestock guardians. Their job requires them to be able to make their own decisions. However, it is very important with this breed that they are well-socialized from an early age to overcome their aloofness and to encourage them to be friendlier to invited visitors. They also need early dog training to be good pets. These dogs require an owner who is firm and in control. They do have a strong desire to please so you can use this to your advantage by using positive dog training methods (praise, rewards).